Monetary grants and donations of books, beads and/or supplies to arts organizations, schools or nonprofit organizations. Direct contributions of time and talents by our members, such as member trips to the Ronald McDonald House to work with clients there. The Bead Society provides all the supplies. Donation of beads by members for the BEADS for Education project benefiting Masaai women and girls in Kenya (www.BeadsForEducation.org) for more information on this nonprofit charity and to see the Masaai beadwork for sale. Donated beads are collected at each Bead Society meeting. Your community service outreach ideas are welcome too! Please e-mail as much information as you have to secretary@southjerseybeadsociety.org. This community outreach project of the South Jersey Bead Society involves giving direct contributions of time and talents by our members to work with the clients there and their relatives. Among its many services, this house provides a place to stay for the families of seriously ill and traumatized children treatment who are undergoing local treatment. Be sure to take a minute and read a little about the Ronald McDonald House of Southern NJ. Kathy Foster and a dedicated team of members volunteer by travelling to this wonderful children's house located in the business and college districts of secure, downtown Camden. We have the opportunity to give hope, laughter, and inspiration to many sick persons by teaching and making beading projects with them and their relatives. This chapter of the Ronald McDonald house is located adjacent to Cooper Hospital and has a secure, well lit, fenced in parking lot. It is located in the heart of the downtown Camden near the Rutgers University, Camden Community College, and Rowan University Camden campuses. Just a few miles from the Ben Franklin Bridge, this area is also regularly policed so volunteers should feel secure coming and leaving this area. If you would like to volunteer in this service, check the Calendar for current days and times. On February 23, 2013, the SJBS sponsored a fundraiser to benefit the Neuroncology Research Department at the Children's Hospital of Philadelphia. The friends and family of Julia Kivlin who passed away from brain cancer at the age of 15, gathered in the parish hall of Ss. Philip and James R.C. Church in Exton, PA to make bracelets under the tutelage of SJBS members. The 121 bracelets that were made will be sold at the Annual Volleyball Tournament held in Julia's honor. Bead Society Visits NJ Veterans Memorial Home, October, 2012 . SJBS volunteers Janet Gildea, Kathy Foster and Johanna Zitto taught a beaded bracelets class at the NJ Veterans Memorial Home in Vineland NJ in October, assisted by members of the Activity Director’s team. The number of residents who participated really impressed them.“We had so much fun! A lot of people came out and we’re really happy with the beautiful bracelets we made. And you girls are so nice,” said resident Mary Hunter, celebrating her 90th birthday.Another participant, Hank, led the group in songs such as God Bless America in an amazing baritone voice, and then we enjoyed cake and coffee! 7000 Bracelets - For the March meeting, the SJBS participated in a charity event called 7000 Bracelets For Hope. This charity organization supports children with rare diseases. The bracelets created by the members were distributed to children with rare diseases by the Bracelets for Hope organization to let them know that people are thinking of them. Please visit the 7000 Bracelets website for more information. Bead For Life - In Janurary, the South Jersey Bead Society hosted a Bead for Life (www.beadforlife.org) party. The jewelry sold at this party were made of paper beads from women in Africa. Funds raised by our efforts went right back to the women who made the beads/jewelry to help them with opening their own business, their education, and their children's education. Lutheran Settlement House - In March, the society sent $250 to the Lutheran Settlement House, in Fishtown PA. This money will be used for Barbara Hanselman's jewelry making class. We also sent $500 to the Moorestown Visiting Nurses for Camp Firefly, a camp for children who lost a loved one, to be used in their art program. Bead Binge Events - During Bead Binge we hosted a Bead for Life table. There we raised another $440 for Bead for Life. We also raffled off Silly Milly and raised $107 to go to Portable Playhouse. Beads of Courage, Inc. - In August 2009, the Society made a $500 donation to Beads of Courage Inc. This organization provides beads and materials to children with serious, life threatening conditions. Initially each child receives a string of beads spelling out their name. For each procedure they go through, from a simple injection to surgery, they receive a specific color bead to add to their string. The beads give the children something physical to show what they have been through. They can tell from the beads if another patient is going through the same procedures, and they can talk to someone who truly understands them. Beads of Courage is involved with numerous hospitals around the country. Our donation will got to the patients at the Children's Hospital of Philadelphia. For more information, go to their web site at www.beadsofcourage.net. The Portable Playhouse, Inc. - In July 2009, the Society made a $500 donation to The Portable Playhouse, Inc. This organization teaches beading to patients in hospital pediatric units and women in outpatient cancer centers. The volunteers teach one on one, as many of the patients are unable to leave their rooms. For many patients, the beadwork gives them the opportunity to think about something other than their illness. This year The Portable Playhouse is running a special fundraiser. For every dollar donated, they will add a bead to a necklace. The goal is to bead the world's longest necklace for the Guinness Book of World Records. Our $500 donation has added a lot of beads to that necklace - green ones, of course! To donate your own addition to the necklace, go to www.longestbeadednecklace.com. We also purchased two Silly Milly dolls. Silly Milly is the ambassador of the Portable Playhouse, accompanying all of their volunteers on their visits. One of the dolls will accompany our volunteers to the Ronald McDonald House. The other will be auctioned at our next Bead Binge, with the proceeds going to the Playhouse. For more information on Silly Milly and The Portable Playhouse, go to their web site and watch the Learn More About Us video at www.theportableplayhouse.org. The Bead Museum of Glendale, AZ - In May 2009, the Society made a $1,000 donation to The Bead Museum of Glendale, AZ. The museum was founded in 1984 to house permanent and changing exhibitions of beads from around the world, from 15,000 years old to today's bead artwork. They also sponsor lectures, workshops, events, etc. that are open to the public. Due to a gap in funding, the museum was in danger of closing, as other bead museums have done. Our donation helped them to reach their first fundraising goal, enabling them to remain open and to work towards their long term goal of becoming self sustaining. For more information on The Bead Museum, go to their web site at www.beadmuseumaz.org. Cancer Survivors Day - Cooper University Hospital celebrated Cancer Survivors Day on June 7, 2008 at its Cancer Institute in Voorhees, NJ. The South Jersey Bead Society participated in this fun-filled day by offering 2 beginner-level make-it-and-take-it projects. About 400 cancer survivors and their families attended and enjoyed the many fun activities, including jewelry making (Bead Society), chair massage, reflexology, reiki, yoga and a Chinese auction. $1,000 grant to Camden County's Arts 4 Teens - a day-long arts festival for 1,200 to 1,500 students 13 to 19. The event was March 14th on the Rutgers-Camden campus. The event was run by the Camden County Cultural & Heritage Commission. BEADS for Education - We provided Debby Rooney a free table again at Bead Binge 2007 for her work with BEADS for Education. 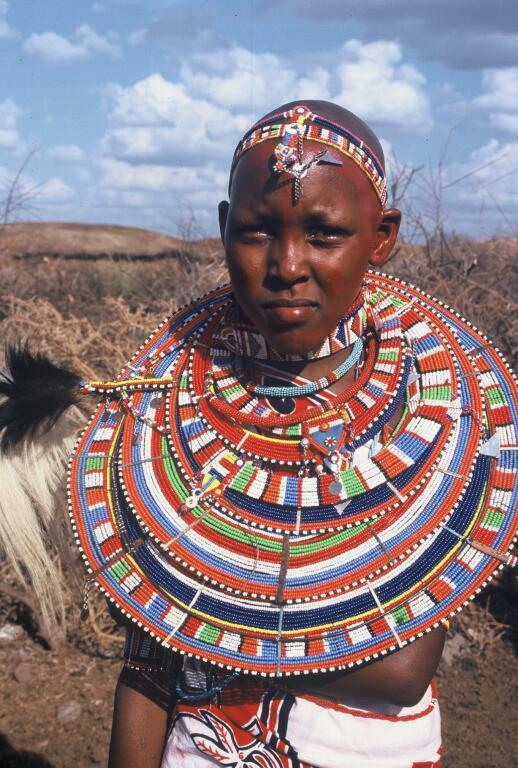 She sold Masaai-crafted beadwork and educating the public about her work. Continued correspondence - with our Masaai girl, Ruth Shanka. Donations of jewelry to Image and Attitude - Image and Attitude, a 501 (c) 3 non profit organization that helps to improve the image and self-esteem of economically disadvantaged women by providing quality business attire and personal and professional development support to help ensure employment success and job retention, received a donation of a number of articles from the SJBS. Update - At Bead Binge 2007 (March), we provided a free table to Debby Rooney, with BEADS for Education. Despite the bad weather and lower-than-normal attendance, Debby said she sold $600 worth of beadwork by the Maasai women's beading cooperative. Two people also approached her about sponsoring a girl. A Bead Society member asked Debby what supplies she needed and with that information, purchased about $100 in materials for BEADS for Education. Debby also said she was approached by the owner of a retail shop about selling the Maasai women's beadwork. Finally, Debby said that she received a large basket of seed beads and specialty beads, all donated by Bead Society members. The value of the donations was about $250. BEADS for Education - $1,600 one-time grant to fund a Masaai girl's high school education, four years total. Our girl's name is Ruth Shanka. She interned as a "primary nursery teacher" and is now studying management. We will be writing her regularly, sending her pictures and a small gift each year. Perkins Center for the Arts - $1,500 one-time grant for three Camden children to participate in a summer arts camp. Boys and Girls Club of Camden - $1,500 one-time grant for summer arts camp for children in Camden. Philadelphia Police Athletic League - $1,500 one-time grant for a girls' self-esteem program. V-Foundation Cancer Foundation - Bead Society purchased materials which our members used to make 21 bracelets that were auctioned off as a fund-raiser. Total cost of the materials was $525. Ronald McDonald House, Camden - three trips by members with 15 volunteers total. We worked with about 50 clients total.